Bulgarian antique traffickers and treasure hunters are flooding the European black market with forged ancient coins and fake archaeological artifacts such as a fake Ancient Thracian treasure which is “on sale" for EUR 200,000, according to the police. The fake Ancient Thracian treasure in question imitates Bulgaria’s otherwise impressive treasures of the Ancient Thracian civilization such the ones which have been on display in the Louvre Museum in Paris for the past few months. The “treasure” is sold by an antique dealer from the southern Bulgarian District of Haskovo, reports the 24 Chasa daily, citing sources from the Bulgarian police who have even managed to obtain a “promotional” photo of the forged artifacts but have not found the dealer yet. 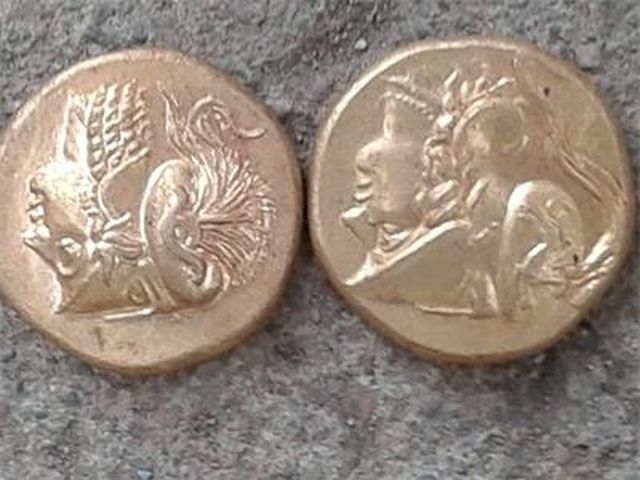 Since the start of 2015, the Bulgarian police units fighting the rampant illegal treasure hunting and antique trafficking all over the country have registered a sharp rise in the sale of fake archaeological artifacts, with Bulgarian-made fake gold coins of Ancient Macedon Emperor Alexander the Great, for example, inundating the collectors’ auctions in Germany, Austria, Switzerland, and the USA. The police also reveal that inside Bulgaria collectors pay between BGN 50,000 (app. EUR 25,500) and BGN 100,000 (app. EUR 51,000) for pricy ancient antiques, and when they discover that they have bought fakes they cannot come to the authorities because the antique trade is illegal. 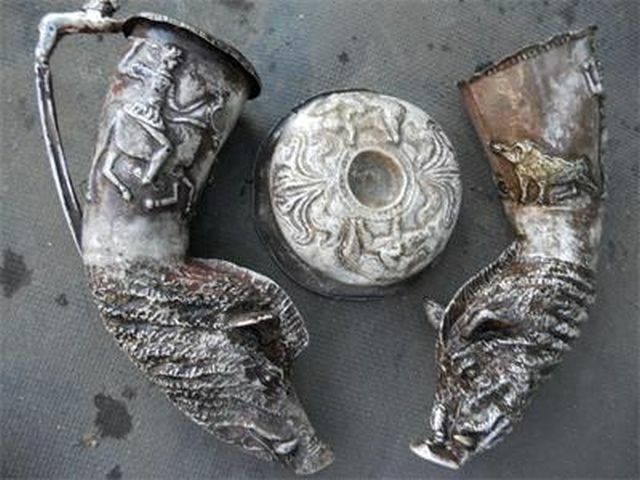 The other major problem inhibiting the prosecution of the treasure hunting and antique trafficking mafia is that when the police catch a forger of archaeological artifacts and ancient coins they cannot charge them because the Bulgarian legislature has not criminalized the production of fake archaeological artifacts yet. The Interior Ministry has now tabled to the Bulgarian Parliament Penal Code amendments criminalizing the forgery of antiques and art items. “The problem is that treasure hunting in Bulgaria is thriving but the uppermost archaeological layer, which is 30-40 cm deep, has already been fully ransacked. At the same time, there is a demand, and the antique dealers start compensating [the lack of supply] with fakes. So if you are used to making and spending BGN 5,000-10,000 (app. EUR 2,550-5,100) [per month], you would not be glad to start making only BGN 1,000 (app. EUR 510)," explains Angel Papalezov, an expert at the Cultural and Historical Artifacts Section of Bulgaria’s National Police. According to the police, there are between 20 and 50 skilled forgers working actively in Bulgaria in “different fields" of forgery such as coins, ceramics, gold jewelry. The top performers among those, however, are about a dozen. 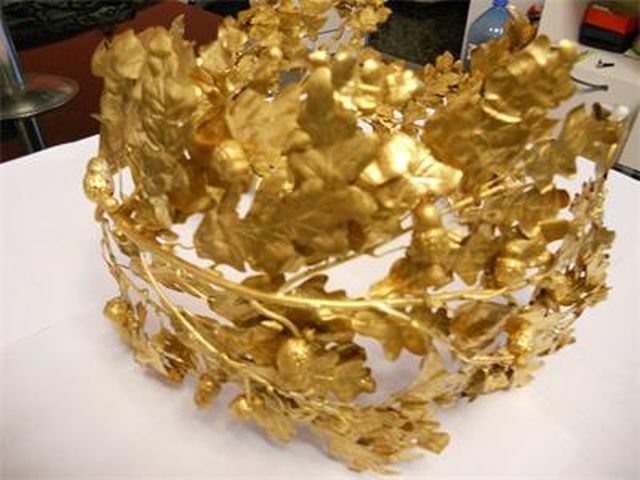 One of the most professionally made fakes detected by the Bulgarian police recently is a forged Ancient Thracian treasure representing a golden laurel wreath with oak leaves which is made of real gold and is designed as a replica of an Ancient Thracian treasure from the 4th-3rd century BC. 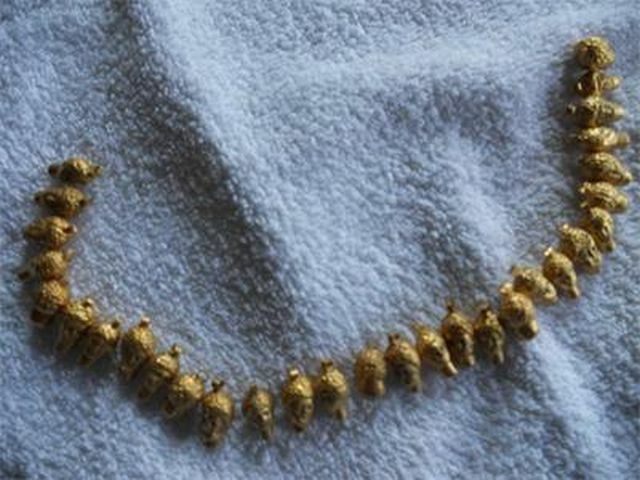 One of the “promotional" photos advertising the treasure to potential buyers, which has been acquired by the police, shows the fake photographed on a recent newspaper to certify its recent “discovery". The asking price for the fake golden laurel wreath presented as real is between EUR 50,000 and EUR 60,000. The most interesting fake known to be on sale on the black market in Bulgaria at the present moment, however, is the fake Ancient Thracian treasure mentioned above, which consists of a breastplate and decorations such as earrings, and is presented as dating to the 3rd century BC, with an asking price of EUR 200,000. 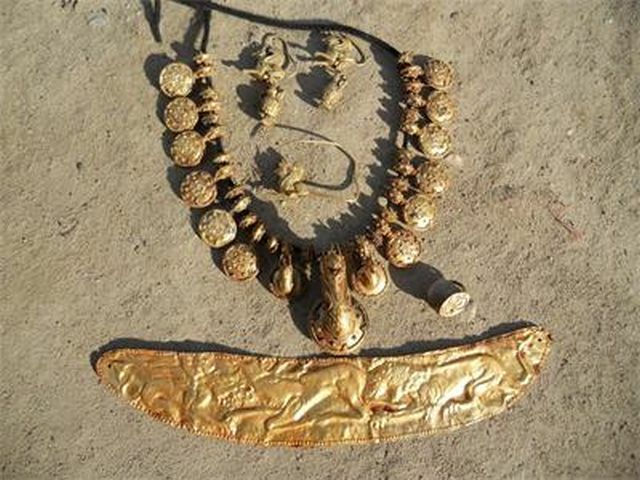 The “promotional" photo acquired by the Bulgarian police shows the treasure on the ground in order to demonstrate that it has been freshly “dug up” (pictured above). The treasure is now known to have been made by a forger in the Haskovo District who does not show the fakes directly but first advertises them to the major collectors using photos. The same dealer is also known to have made several major sales of forged archaeological artifacts. Some of the buyers, however, figured out they had been cheated, and, using “unofficial channels", have managed to “annul" their deals. None of them can complain to the police, however, because the engaging in the trade of archaeological artifacts itself is illegal. The absurd legal situation in Bulgaria actually requires that the police give back any archaeological fakes even if they discover them because the making of replicas of antiques is not illegal in Bulgaria. “We have recently had a case with a treasure hunter who is also a dealer. When we caught him, he told us that he carries only fakes, mostly coins, because “whoever isn’t knowledgeable, deserves to get it", and if the we catch him, the examination establishes that the items are fake, and this becomes non-punishable crime. Thus, many treasure hunters are able to get away," explains an unnamed police officer. The most frequently forged archaeological items in Bulgaria are ancient and medieval coins from all types and time periods. On the “retail market", coins that are sold for about EUR 200, are forged for about EUR 15-20, giving the forger a tenfold profit from a single coin, the report says. The more skillful forgers, however, are said to be focusing on the making of fake coins of Alexander the Great, with these fakes said to be flooding the collector’s auctions in Germany, Austria, Switzerland, and the USA. Skilled forgers from Southern and Eastern Bulgaria are said to be making fine replicas of Ancient Thracian rhyta and phiales. In order to make sophisticated fakes and dupe the experts, the forgers use materials that are close to the respective archaeological period, and mix real and fake archaeological artifacts. “In one of the latest cases of examinations that we have commissioned in the National Museum of History, we have seen that the artifacts that we captured are mixed," police sources are quoted as saying. Under this approach, for example, if 20 ancient ceramic vessels are smuggled to Germany, 5 of them are real. This makes it easier to delude the experts, and when the items get examined, the examiners discover that some of them are real. If the fakes are good, they may not even get discovered. According to police expert Angel Papalezov, the most skilled Bulgarian forgers specialize in coins but there are also “imports" of forged coins from Turkey, Afghanistan, and Syria. “In addition to the fact that the treasure hunters have already searched through the so called upper archaeological layer, the main problem is that the forging of archaeological artifacts has not been criminalized in Bulgaria. Thus, if a fake gets sold, and the buyer complains to the police that they have been cheated, they may get charged… We have tabled amendment proposals for that but they have not been reviewed yet. Unlike Bulgaria, in France and Italy, it is the person who offers and makes the fakes, and the person who certifies the authenticity of fake items who are liable," Papalezov explains. He says that the Interior Ministry has asked for Penal Code amendments providing for a sentence of up to 6 years in prison for the production of fake antiques and trading them. He also reveals that the Bulgarian police have started investigations over the offers of antiques and archaeological artifacts online, including on shopping sites such as eBay. “There are [treasure hunters] digging everywhere [in Bulgaria]. In many areas, every single village has an archaeological site. In the treasure hunting raids, very often, in order to find 5 or 10 coins, the treasure hunters destroy an entire archaeological layer, and this way the historical trail and the restoration possibilities are lost," the police expert emphasizes.